My parents are having quite a time in Kenya. I got an email from them which contained the following description of what they did for Easter. In Kenya, The Show Must Go On! 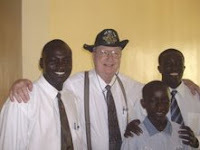 On Saturday, February 17, 2007, the Kitale Elders had a baptism scheduled. 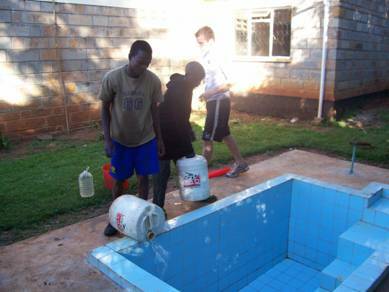 Unfortunately, the Kitale town water system had not been working for many days. There was no water in the pipes and the Branch storage tanks were empty. What were we to do? the people we have to see are so widely scattered that it is the only feasible way. off onto a track with bushes scraping the sides of the pickup, barely making it through mud puddles, finally getting out and walking a hundred yards and there is a mud hut where the Relief Society President lives! She welcomes us, obviously very pleased with our visit, and invites us inside her home. Inside it is very dark and often quite hot, especially if the hut has a metal roof. She has a low table covered with a cloth she has embroidered, surrounded by a wooden couch and a couple of wooden chairs. She prepares a cup of hot cocoa for us as we watch the chickens come and go through the open door. All the children in the neighborhood gather around to see the visiting “wazungus”(white people) and want to shake our hands. A cow wanders past the door. visiting and is not a member of the church. She asks one of us to leave a blessing on her home, which we are glad to do. We part with many hand shakes and smiles and with tears in our eyes, stunned by her humble circumstances and her strong testimony and absolute dedication to the gospel. She walks two hours to get to church every week. That is two hours to church and another two hours back home! As we drive away we feel shame at the knowledge that if our circumstances were reversed we would probably not even be active members. Who is actually teaching the gospel here, she or us? Thought you might appreciate this perspective. computer now. We will get back to you again as soon as we are connected. seeing much that is strange. Sounds like a typical mission so far. From left to right, President Gabriel Kandawala (Sikhendu Branch), Elder Nielson, Edward Ndung’u (son of Kitale Branch president), and President Martin Ndung’u. President Ndung’u had just presented your father with the hat he’s wearing, to protect him from the sun. My dad seems quite happy, which makes sense. He likes hats. My parents went into the MTC this week in preparation for their mission to Kenya. In a way I feel like I am sending them on their mission. But why should this be? I am not funding their mission. And we have not lived in the same time zone for more than a decade. Sure we talk on the phone every few weeks, and send a few emails, but we can still do that after they leave. So why do I feel the way I do? It may be that I have a sense of empathy for what they are about to do. My heart goes with them. Oh, how I wish I could observe them in action! Pictures and emails will be great, but not like the real thing. What an exciting time! The retired geography professor and the local librarian, the long time stake presidency and bishopric member and the multi-term relief society president and young women’s leader, the former peace corps workers returning to the same area after 45 years. A compelling call. The perfect call for the people, the perfect people for the call. Have a good mission mom and dad. I noticed that the church has announced the completion of a temple in Finland here. The article mentions that there are 5,000 members in Finland. 5,000. Pretty impressive huh? The article also mentions that there are now 10 temples in Europe. Countries like Norway, Belgium, Denmark, and similar countries have memberships about the same as Finland – 5,000 or so. With my new curiosity regarding Kenya following my parents’ mission call, I couldn’t help but notice that Kenya has 6,000 members, and that the nearest temple is in South Africa. With the number of years we have been sending missionaries to Scandinavian and European countries, one would think that there would be more than about 5,000 members in these countries, and that there would be fewer missionaries and temples given the lack of converts and numbers. Does it not make just as much sense in terms of numbers and geography to have a temple in Kenya as it does to have a temple in Finland? What am I missing? I make a similar case for missionaries at Blogger of Jared here.